In today's episode, I talk with Jamie Masada, the owner and founder of the Laugh Factory, a comedy club on the Sunset Strip for over 25 years. Every Wednesday throughout the strike the Laugh Factory turned over all door proceeds to the Writers Guild Foundation Industry Support Fund. This fund was set up through the Writers Guild Foundation for all below-the-line personnel in need of financial help of which writers do not benefit. Recorded Wednesday, 20 February 2008. For information about the efforts to raise money for the Writers' Guild Foundation Industry Support fund here is an episode that aired last month on the American Public Media show Marketplace in which Jeff Tyler reported how the writers were raising money for people who work behind the scenes. WHEN: Tuesday, March 4th at 8 p.m.
To celebrate the end of the strike, Laugh Factory owner Jamie Masada will host a “Reconciliation” Benefit at the Laugh Factory, Tuesday, March 4th at 8 p.m. 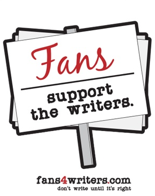 Proceeds go to the Writers Guild Foundation Industry Support Fund to assist all those NON-WRITERS above and below-the-line struggling financially due to the strike. The GENERAL PUBLIC is invited. The $20 admission fee will be donated to the Fund. Cash or check made out to the WGF Industry Support Fund only. RESERVATIONS RECOMMENDED. SPREAD THE WORD!